Students can write the numbers 0-9 on index cards to do this activity, or you can use the cards from an UNO deck (digit cards only). Students take one of each number (0-9) and lay out the cards in front of them. Students can do this in pairs or individually. The teacher says a number and the students build that number using the cards in front of them. The teacher can easily do a quick check and redirect any students who may have an incorrect number (in the target language of course). Depending on the level of the students, numbers can go as high as 9 billion. I usually stick to numbers under 100 for beginners or in the hundreds and thousands for more advanced students, but it could be a good challenge to go higher. Just keep in mind that numbers can’t be repeated (22, 336) since there is only one of each digit. Of course, the teacher can provide multiples of each digit, but I find that there are to many cards to manage. It’s great when students get the hang of it and want to say the numbers for their classmates to build. Students can progress in their foreign language writing skills, spelling and identification of sound-letter (or letter combination) correspondence by doing dictations. The traditional use of dictation in the language class did not provide much opportunity for student engagement or interaction. Below is a dictation process that I have created to make the process of doing dictation in the foreign language classroom that is more engaging and interactive for students. The 5 steps can be done in one class or spread out over two or three days. The topic should include vocabulary and verb forms that are familiar to students. The teacher reads the entire dictation at a fluent speed. The teacher then reads each sentence slowly, word by word, so that students can write the sentences. The teacher finishes the dictation by reading the entire dictation a last time at a fluent speed. Students copy the dictation from a handout, the board or a projected screen without referring back to the dictation that they wrote in the first step. Students should be expected to write the dictation perfectly as they are copying it. Students read through the dictation that they wrote in step 1 and correct any mistakes they made, using the dictation text that they copied as a reference. Students pair up and take turns reading the dictation (that they copied in step 2) to each other and writing it out. Students then trade and correct each other’s work using the dictation text that they copied in step 2. The teacher repeats step 1. The teacher then grades the final written dictation. Interactive Foreign Language Activities with …Cothespins? Clothespin activities are an engaging way to practice listening and speaking skills in the target language. Everyone has a card and a clothespin. They hear a question or prompt and clip the clothespin on the card to mark the answer. Clipping on the clothespin engages students and the teacher can quickly check the answers visually. Clothespin activities can provide excellent listening and speaking opportunities. Students can ask the questions and take turns giving instructions to the group or they can work in pairs. 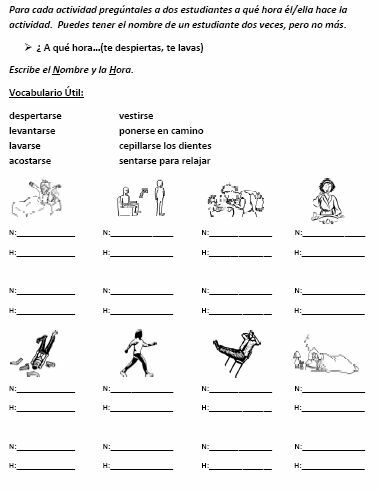 You can make this more interactive with cards that students flip over with a picture and words to pin or subjects and infinitives with conjugated verb forms to pin. This is a a good version for small groups or pairs and it can be a little competition. With this Interactive Crossword Puzzle students have the opportunity to practice speaking, listening and writing in the target language. Partner #1 has the A picture sheet and the B crossword puzzle. Partner #2 has the B picture sheet and the A crossword puzzle. The two partners alternate reading a clue out loud from the crossword clues on his/her crossword puzzle sheet. The other students has the answers on the picture sheet and provides the answer orally at which point the student reading the clue fills in the answer. 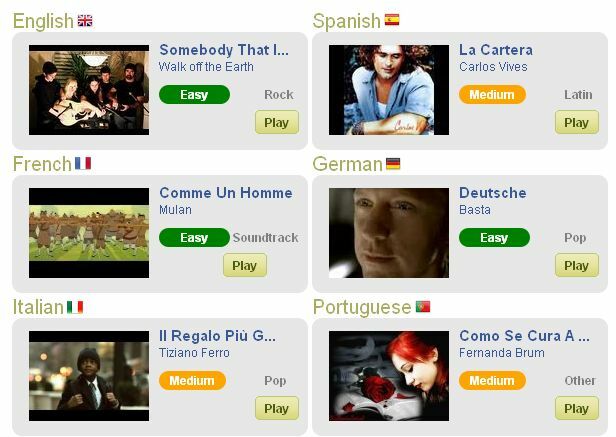 These can be created using websites to create word puzzles or you can download the activities below. Give your students an opportunity to practice and gain confidence in speaking, listening and writing in the target language. This activity can focus on any verb tense as well various other grammar points. Students circulate in the classroom and ask each other questions using the subject pronoun and verb (in the correct form) found on their paper. The objective is to find the other person who has the same 6 sentences. My activities typically include 6 matches. If there are more than 12 students in the class, I simply photocopy additional slips and students need to find their group of 3 or 4 that all match. When a match (or group) is found, the students work together to write the six sentences in the target language. The entire activity can easily take place in the target language. 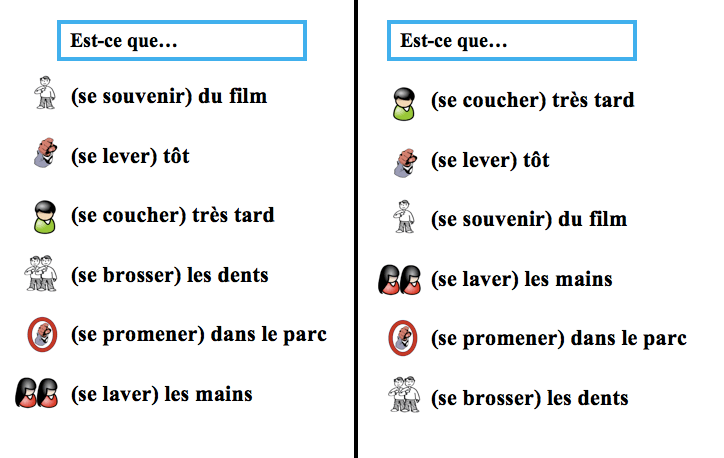 The example below is for reflexive verbs in French. These two papers match, but only these two. The other four have one verb that is different. 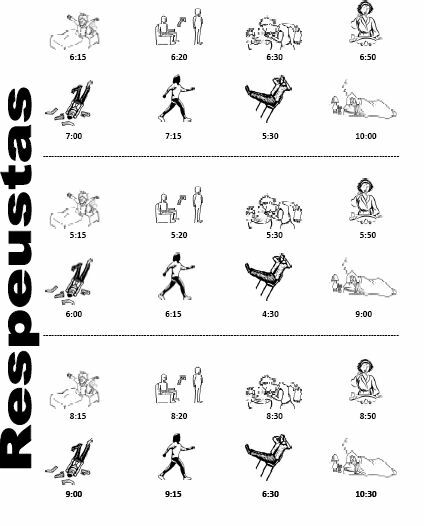 This is a great activity that I use to get students moving around the classroom and speaking to each other in the target language using reflexive verbs along with reflexive pronouns. Student ask each other when they do certain activities (wake up, go to bed, wash up, etc) and record answers. I provide students with a question sheet as well as an answer sheet ( which includes times to use in response to questions). All information is presented with pictures to avoid translation. 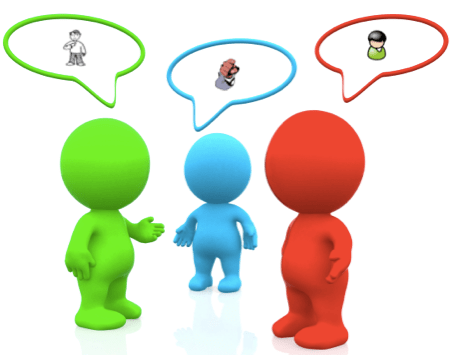 A follow-up activity requires students to ask about another person so that a different reflexive pronoun is also used. Students have a lot of fun with this communicative activity.